May the Lord keep you in his hand and never close his fist too tight on you. This fine bone china Irish plate is enhanced with the a traditional child's blessing along with Celtic knot illustrations that are inspired from ancient Irish manuscripts. 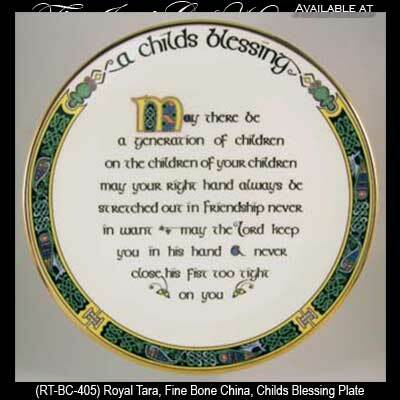 The child's Irish blessing plate measures 8 3/4" in diameter and is made in Galway, Ireland by Royal Tara China. The Irish child's blessing plate is gift boxed with a Celtic knot history card that is complements of The Irish Gift House.